The Alien II–which is designed for cyclists who need a high-quality tool while on the road–is housed in a clever break-apart body that makes it a breeze to find the right gadget. And with 26 high-quality, hardened-steel tools at your fingertips, you’ll rarely find yourself without exactly what you need. 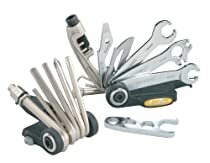 The tools include 14g and 15g spoke wrenches, two integrated tire levers, a T25 Torx wrench, Phillips and flat-head screwdrivers, a mini pedal wrench for field repairs, eight sizes of Allen wrenches (2 through 10mm), six box wrenches (two 8, 9, and 10mm sizes), a steel wire chain hook, a stainless-steel knife, a cast Cromoly steel chain tool, and compartments for two chain pins. There’s even a bottle opener for post-ride celebrations. The Alien II measures 3.4 by 1.7 by 1.6 inches (W x H x D) and comes with a ND nylon storage bag with a belt clip.